Like most of the guys I know, I’m somewhat challenged – which is to say nearly clueless – when it comes to choosing the right gift for special occasions. I shudder at some of the embarrassing selections I’ve made over the years. Many are on permanent display in the Gift Giving Hall of Shame. Photo © Johnny Autry and used with permission of Storey Publishing. You would think that 15 years of marriage to the love of my life would have cured me of this affliction, but it hasn’t. Indeed, there seems to be an inverse relationship between the depth of my love and my ability to express it with a suitable purchase. Go figure. 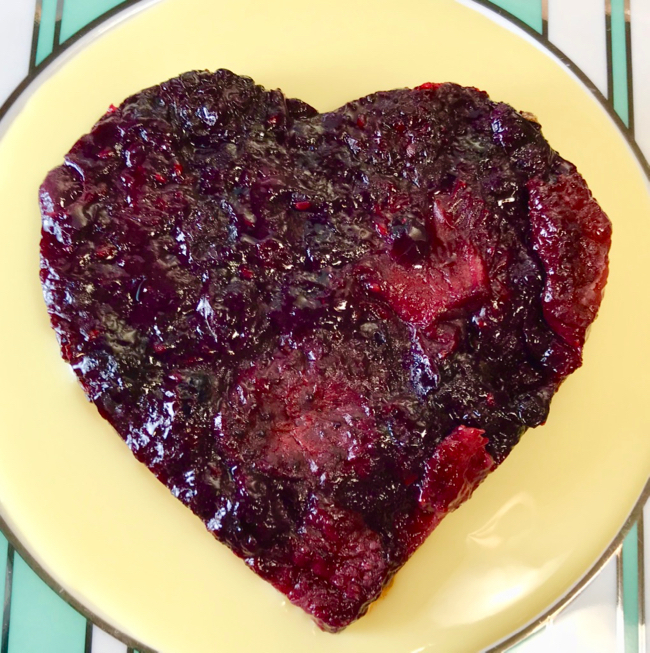 I bring this up today, Valentine’s Day – and I’m talking mainly to you, now, my baking brethren – because I’ve managed to bake my way out of a gift dilemma more than a few times. A way with a recipe has been my saving grace. Flowers are fine. Jewelry can impress. But your heart will always belong to the lady you bake for. Relax: you don’t have to be a pastry chef or even an accomplished pie maker to test out my theory. I’ve made sure of that by choosing one of the easier recipes for you to try, from my latest book, The Harvest Baker. It’s a crostata – essentially a low slung, free-form pie. You just roll out the dough, get it on the baking sheet, cover with a fresh berry filling and bake. Yes, I know it’s winter and good fresh berries are expensive and hard to come by; I’m not that clueless. So I’ve also included directions for making the crostata with frozen berries, too. Serve in wedges, still warm, with a scoop of ice cream. Or really put your heart out there and cut heart shaped servings with a large cookie cutter and serve in a pool of Vanilla Custard Sauce, as in the photo above. Either way, that’ll say I love you better than any Hallmark card ever could. 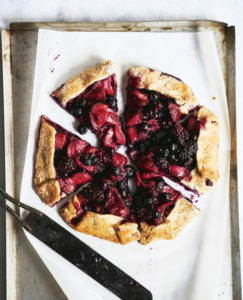 Just about every kind of fruit under the sun can go into a crostata, but this all-berry version has to be one of the best combinations out there. Make with fresh berries in the summer, and frozen ones in the winter. If you haven't already, prepare the dough and refrigerate it for at least an hour before rolling. Preheat the oven to 400°. Have ready a large baking sheet, preferably a rimmed one. Combine all of the berries in a large bowl. Mix 1/3 cup sugar and the cornstarch in a small bowl. Add the sugar and cornstarch mixture to the fruit; mix well. Mix in the lemon juice, orange zest, and nutmeg. Scrape the fruit out of the bowl and into a mound in the center of the dough. Spread it out evenly to create a 9-inch circle of fruit, with a 1 1/2 to 2-inch border all around. Using the parchment itself or a spatula to help you lift, fold the edge of the pastry over the filling a few inches at a time. As you make your way around the dough, the border will sort of self-pleat, enclosing a lovely circle of fruit in the middle. Lightly brush the dough border with cream. Bake for 20 minutes, then reduce the heat to 375° and bake for about 25 to 30 minutes more. When done, the edge of the crostata will be golden brown and the filling will be bubbling. Transfer the baking sheet to a cooling rack and cool the crostata, directly on the sheet, for at least 30 minutes before serving. Variation: To make the filling with frozen berries, use equivalent amounts of frozen fruit. Heat in a large, heavy-bottomed pot over medium heat. Mix the sugar and cornstarch in a small bowl. When the fruit starts to get juicy, even if it's still partially frozen, stir in the sugar mixture. Gradually increase the heat and bring the fruit to a boil, stirring virtually nonstop as it heats. When the fruit starts to boil, cook for 1 1/2 minutes, stirring constantly, then remove from the heat; it will have thickened quite a bit. Transfer the filling to a bowl, stir in the lemon juice and zest, and cool thoroughly. If you're not assembling the crostata right away, cover and refrigerate the filling until needed. Assemble the crostata as above, substituting the cooled, cooked filling for the fresh filling. Bake as above. Since the filling has already cooked, the crostata is likely to take less time to bake. So long as the crust is nicely browned, you're probably good to go. The buttermilk and confectioners' sugar in this recipe makes for a tender, slightly sweet crust that works well for virtually any fruit crostata. The recipe makes enough dough for one large crostata. Combine the flour, confectioners' sugar, and salt in a food processor. Pulse several times to mix. Remove the lid and scatter the butter over the dry ingredients. Give the machine 8 to 10 one-second pulses, until the butter is broken into fine bits. Pulsing the machine again, add 1/4 cup buttermilk through the feed tube in a single 5-second stream. Stop pulsing the machine when the mixture starts to form clumps and before the dough balls up around the blade. If the dough seems to need a bit more liquid, add a teaspoon or two additional buttermilk. Turn the dough out onto a lightly floured surface and shape it into a ball. Place the dough on a sheet of plastic wrap and flatten it into a disk about 3/4 inch thick. Wrap the dough in the plastic and refrigerate for at least 1 hour before rolling.